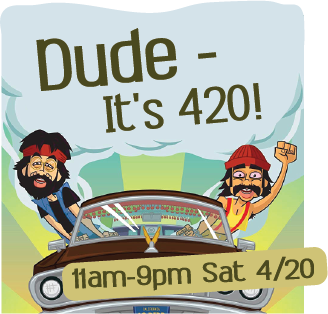 Join us for a day-long 420 event at Throwback Brewery, where we will be featuring a special CBD cocktail, CBD shandies, a dank version of our popular Donkey-Hoté Double IPA, and killer munchies all day! The price for this session is just 10 dollars, and it includes 2oz each of Coyote River Hemp Company’s CBD Maple Lemonade and CBD Cold Brew coffee, PLUS your choice of a Throwback CBD Maple Lemonade shandy – choose from either Cheek Squeezer or True Grits. Only 25 tickets are available. Get yours today! 12-4pm. Chair massages – Masseuse Tessa will be here to help you relax and get your mellow on. Chair massages will be $1 per minute. 4:20pm- Pause for a pub-wide toast. ALL DAY – We’ll offer a tasty CBD cocktail, freshly baked food specials designed to satisfy your need for munchies (think tater tot waffles, Frito Pie with Bison Chili, and Moon Pies), and an extra dank smelling & tasting version of our Donkey-Hoté Double IPA. And, there just might be some Dead cranking on the sound system!